Liam F. Benson’s Expected Ruler, who is trained by 20-year-old Liam Benson, a student at the University of Louisville’s Equine Industry Program will be looking to give the young trainer his first graded stakes victory in Saturday’s $100,000 Iroquois Presented by U.S. Bank (GIII). The son of Leroidesanimaux is the 5-1 morning line third choice in the betting, and gave Benson his first stakes victory last time out when he scored a 47-1 upset in the non-graded Tyro Stakes at Monmouth Park. Although the race was a month ago, Benson is still soaking in the victory. The 2-year-old colt’s victory in the Tyro is his lone start to date. Benson wanted to take a shot in a stakes with the horse first time out. The Iroquois will be the Florida-bred’s first start over the dirt and around two turns. Benson is confident about Expected Ruler handling both as he trained over the Churchill main track last Saturday and handled it “extremely well” according to the trainer. Wilmer Garcia, the pilot for the colt’s victory in the Tyro, has the mount on Saturday. Also entered in the Iroquois is Conquest Stables’ Conquest Windycity, who is the 7-2 morning line favorite and comes off a runner-up effort in a maiden special weight on the turf at Saratoga where he was beaten 2 ¼ lengths. Norman Casse, assistant to his father Mark, has had this race in mind for the son of Tiznow before his last start. Steve Landers’ Twirling Cinnamon was a well-beaten eighth in the Sanford (GIII) at Saratoga in his most recent start, where trainer Brad Cox stated that the son of Twirling Candy might have struggled a little bit. Cox feels that distance won’t be as much of an issue for the horse, and is more concerned with how he’ll handle the class of the field. The field for the Iroquois, from rail out (with jockey and odds): Conquest Windycity (Shaun Bridgmohan; 7-2), Meeteetse Fly (Joe Johnson; 15-1), Expected Ruler (Wilmer Garcia; 5-1), Codominium (Jon Court; 8-1), Unbridled Outlaw (Corey Lanerie; 4-1), Cocked and Loaded (Emmanuel Esquivel; 6-1), Star Hill (Jose Ortiz; 10-1), Dothat Dance (Marcelino Pedroza; 20-1), Missile Bomb (Victor Lebron; 15-1), Rated R Superstar (Calvin Borel; 8-1), Twirling Cinnamon (Brian Hernandez, Jr.; 12-1), Baychimo (Paco Lopez; 30-1). CALL PAT LOOKS FOR STAKES REPEAT IN LOCUST GROVE – Also a part of Saturday’s card is a duet of stakes for older fillies and mares. The $100,000 Locust Grove is run at 1 1/16 miles on the main track and will feature Miller Racing LLC’s Call Pat, who is the 6-1 third choice in a field of 12. The homebred daughter of Lawyer Ron is coming off of a victory in the Groupie Doll (GIII) at Ellis Park and trainer Brad Cox believes the race will set up well for the 5-year-old mare. If all goes well on Saturday, Cox said that the $500,000 Spinster (GI) on Oct. 4 at Keeneland could be her next start. Jockey Shaun Bridgmohan has the mount aboard Call Pat. LOCUST GROVE’S FLASHY AMERICAN IN FOAL TO ORB – Preston Stables LLC’s Flashy American, winner of the 2013 edition of the Locust Grove, looks to return to her winning ways in what could be her final career start. 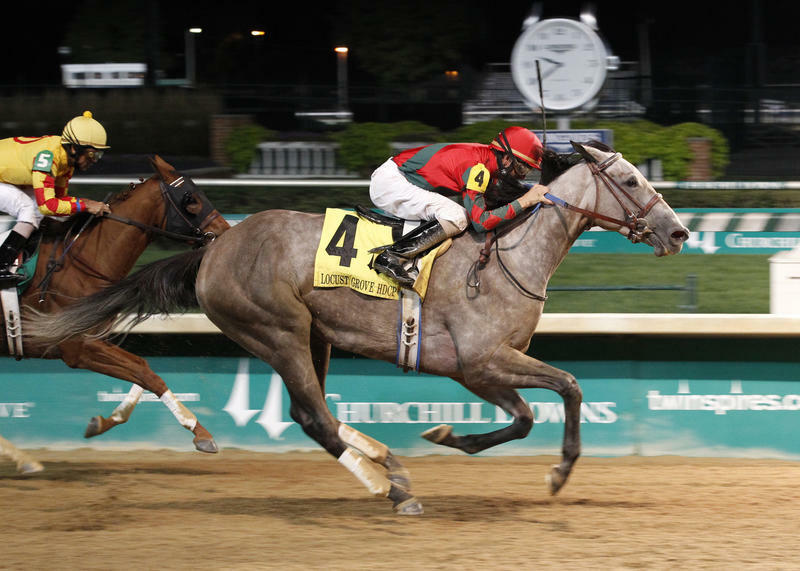 According to trainer Kenny McPeek, the 6-year-old mare is currently in foal to 2013 Kentucky Derby Presented by Yum! Brands (GI) winner Orb. Last time out the homebred daughter of Flashy Bull was soundly beaten in the Groupie Doll at Ellis, where she was 11th beaten 11 lengths behind Call Pat. Corey Lanerie will be aboard Flashy American, who is the 10-1 fifth choice in this event. G. Watts Humphrey’s Frivolous, the 3-1 morning line favorite, comes off a runner-up effort behind Sheer Drama in the Delaware Handicap (GI) at Delaware Park. Earlier in the summer, the homebred daughter of Empire Maker pulled off a 32-1 shocker in the Fleur de Lis (GII) at Churchill Downs. A milder upset was pulled by the Vicki Oliver-trained mare last fall when she took the Falls City (GII) on Churchill’s Thanksgiving Day card. Veteran rider Jon Court, the pilot in both of those graded stakes victories, will be in the irons for the Locust Grove. Stonestreet Stables’ Keen Pauline, co-second choice at 5-1 odds, could potentially scratch and run in next Saturday’s $1 million Cotillion (GI) at Parx Racing. A decision regarding where the daughter of Pulpit would run will be made Friday afternoon, according to trainer Dale Romans. The Locust Grove field, from rail out (with jockey and odds): Unbridledexplosion (Brian Hernandez, Jr.; 8-1), Legacy (Calvin Borel; 12-1), Flashy American (Corey Lanerie; 10-1), Privet Hedge (Jose Ortiz; 8-1), Cabana (Luis Quinonez; 5-1), Frivolous (Jon Court; 3-1), Pearl Turn (Ricardo Santana, Jr.; 30-1), Ambusher (Abdiel Jaen; 30-1), Diva’s Diamond (Colby Hernandez, Jr.; 8-1), Keen Pauline (Paco Lopez; 5-1), Henny Jenney (Victor Lebron, 30-1). SPELLING AGAIN SHORTENS UP FOR OPEN MIND – Sea Jay Racing’s Spelling Again, comes into Saturday’s $100,000 Open Mind fresh off a trip to the winner’s circle for trainer Brad Cox. The daughter of Awesome Again was last seen winning a one-mile allowance optional claiming event at Indiana Grand Racing & Casino, and will be backing up to six furlongs which Cox believes will be an advantage. This will be the 4-year-old filly’s fourth start for Cox after claiming her off of California-based trainer Peter Miller back in May. Shaun Bridgmohan will be aboard the 3-1 morning line second-choice. Westrock Stables’ Heykittykittykitty, the 5-2 morning line favorite, looks to improve off of a seventh-place effort in the Saylorville on June 27 at Prairie Meadows. Prior to her race at Prairie Meadows, she was second in the Winning Colors (GIII) behind Whispering Oaks Farm LLC’s Street Story on May 25. Trainer Ron Moquett is confident about how the 4-year-old Oklahoma bred filly will perform on Saturday. “She’s been doing perfect, but the race will be tough for the purse,” Moquett said. Ricardo Santana, Jr., the pilot in her most recent start, will be aboard the Oklahoma bred filly once again. The Open Mind field, from rail out (with jockey and odds): Bird Maker (Brian Hernandez, Jr.; 7-2), Elusive Fate (Corey Lanerie; 7-2), Heykittykittykitty (Ricardo Santana, Jr.; 5-2), Brown Eyed Mary (Carlos Lugo; 8-1), Spelling Again (Shaun Bridgmohan; 3-1), Anusara (Jose Ortiz; 6-1). The Open Mind Stakes in named in honor of Eugene V. Klein’s two-time Eclipse Award winning champion filly, who captured the Breeders’ Cup Juvenile Fillies and Kentucky Oaks at Churchill Downs in 1988 and 1989, respectively. Hall of Fame trainer D. Wayne Lukas campaigned the New Jersey-bred daughter of Deputy Minister, who was inducted into racing’s Hall of Fame in 2011. ELLIS LEADING TRAINER AND RIDER HOPE TO STICK TO WINNING WAYS – Ellis Park leading trainer and rider, Brad Cox and Didiel Osorio, reflected on their successful summers and are hoping to continue such success during Churchill Downs’ September Meet. Cox led all trainers with 11 wins during Ellis’s summer meet just beating Ian Wilkes who scored 10 wins, while Osorio rode 25 winners, beating out Brian Hernandez Jr.’s 21 wins. This was a first training and riding title for both Cox and Osorio. 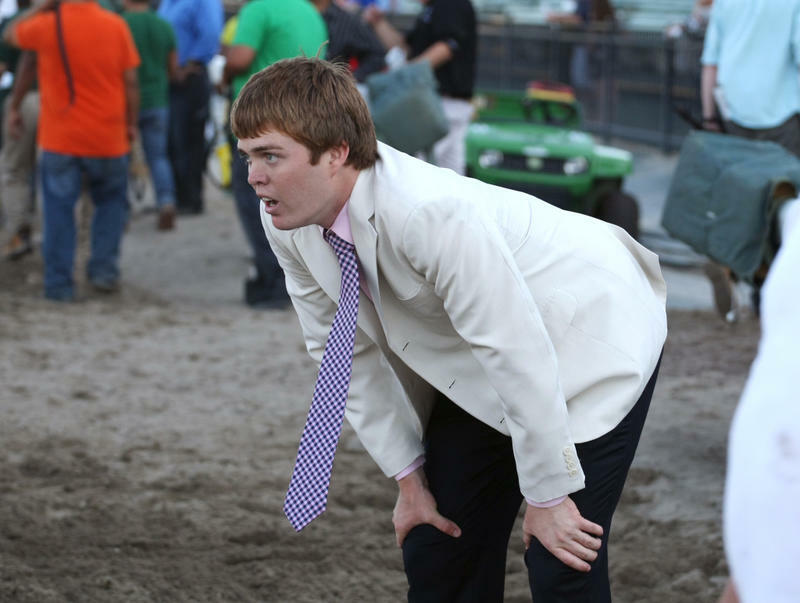 Cox split his time this summer between racing at Ellis and at Saratoga, where he had a small string of horses for their summer meet. Cox went on to say that Believe in Bertie would be pointed toward the $150,000 Jessamine (GIII) at Keeneland on Oct. 7. His training title was locked up on Ellis’s closing day, Monday, Sept. 7, the same day that he and his wife welcomed their new son, Brodie Nowlin Cox into the world. “Between having my baby boy and winning the training title, this has been a very good week to say the least,” he said. This good week could get even better for Cox, as he has horses entered in multiple stakes at three different tracks this weekend. Aside from his three stakes contenders at Churchill, he also sends out Cash Control in the $300,000 Kentucky Downs Ladies Sprint at Kentucky Downs, as well as a trio of horses for Louisiana Downs’ big weekend. He will send out Allied Air Raid in the $400,000 Super Derby (GII), Uncle Brennie in the $75,000 Sunday Silence Stakes and Meeting Waters in the $75,000 River Cities Stakes. Although he has horses at numerous tracks, Cox is planning on staying at Churchill on Saturday. Osorio and his agent Jose Santos Jr., son of Hall of Fame jockey Jose Santos, are hoping to continue their winning ways during the September Meet as well. Osorio, 21, was very excited to win his first meet as a leading rider. Osorio and Santos are very grateful for the opportunities that they have been given to ride for some of the top trainers. Osorio plans on continuing to race on the Kentucky and Indiana circuit throughout the rest of the year before going to Oaklawn Park in the winter for the first time. For the past couple of years, he has spent his winters at Turfway Park. 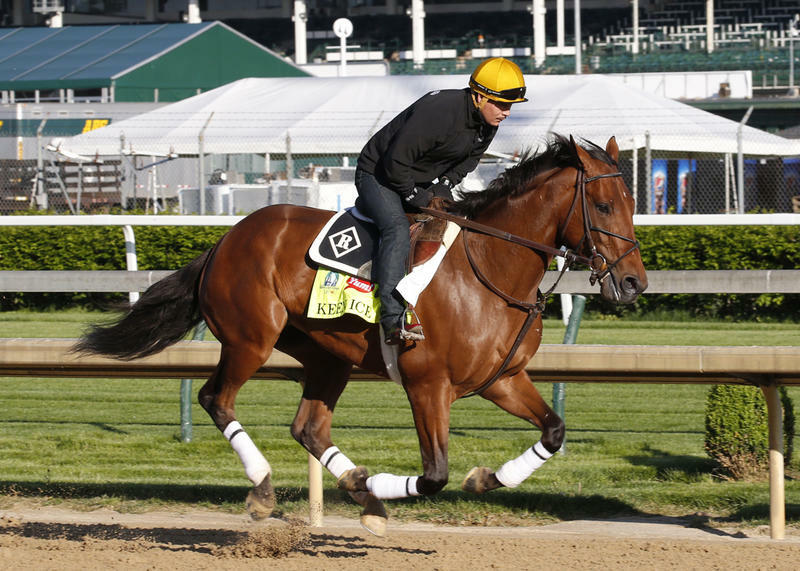 TRAVERS VICTOR TRAINS ON CHURCHILL MAIN TRACK WITH BREEDERS’ CUP IN MIND – Donegal Racing’s Keen Ice continued training for the $5 million Breeders’ Cup Classic on Friday morning at Churchill Downs. The son of Curlin, who last time out upset Triple Crown winner American Pharoah in the Travers Stakes at Saratoga, jogged two miles around the Churchill Downs main track with exercise rider Faustino Aguilar in the irons for trainer Dale Romans. Romans described Keen Ice’s victory in the Travers as “probably the biggest win of my career”. “Someone will win the Preakness next year, someone will win the Breeders’ Cup, the Dubai World Cup, but it’s been almost 40 years since somebody beat a Triple Crown winner up there in that kind of environment with that kind of electricity in the air. It’s very rare that you get to do something that special,” he said. CASSE HOPING FOR BIG MEET WITH TWO-YEAR-OLDS – Norman Casse, assistant trainer to his father Mark, is hoping for a successful September Meet and looks forward to racing some of his 2-year-olds at Churchill this month. Casse will be starting two 2-year-olds on the Opening Day card in Conquest Stables’ Conquest Big E (Race 5) and John C. Oxley’s Gametown (Race 8); Shaun Bridgmohan will be in the irons for both horses. The former of the two will be making his career debut, while the latter will be racing second time out. The son of Street Sense ran second in a maiden special weight on the turf at Saratoga last month. “He showed in his last race that he’s pretty talented,” Casse said of Gametown. Overall, Casse is grateful for Churchill Downs racing in the month of September, which they began doing two years ago. ALSVID BREEZES WEDNESDAY; TARGETS KEENELAND STAKES – Black Hawk Stables’ Alsvid was on the work tab Wednesday morning working a five-furlong bullet in :59.40 with Chris Landeros aboard. Trainer Chris Hartman is hoping to point the 6-year-old son of Officer to the $250,000 Phoenix (GIII) at Keeneland on Oct. 3. Last time out he was a well-beaten fifth in the Smile Sprint (GII) at Gulfstream Park on July 4, which Hartman blamed on the weather conditions. “It was too hot for him down there; he didn’t like the Miami heat,” Hartman said.